Although the hay delivered only provides temporary relief, it’s about showing fellow Australians that someone cares about them. Awareness and education are also important for Brendan and the team because they believe “Aussie farmers are critical to our future in Australia”. Drought doesn’t just impact farmers. It also impacts local businesses and schools within that community. 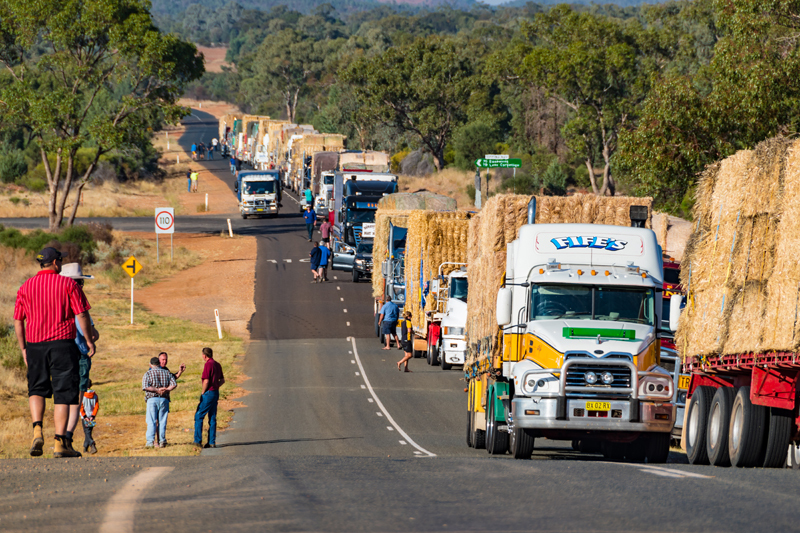 Although the primary focus is taking hay to farmers, runs have also included trucks of dog food, fruit/vegies, pantry essentials, toiletries, household items, and other donations from community groups and local businesses across Australia. All the hay is donated from generous farmers across Australia, and money constantly being sought to fuel the trucks transporting the hay. No one in the BHR is paid a wage. 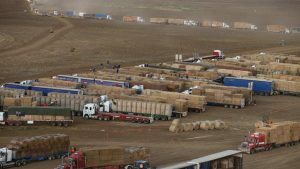 Everyone volunteers, including all the truck drivers who also donate the use of their trucks and machinery to load and unload the hay. 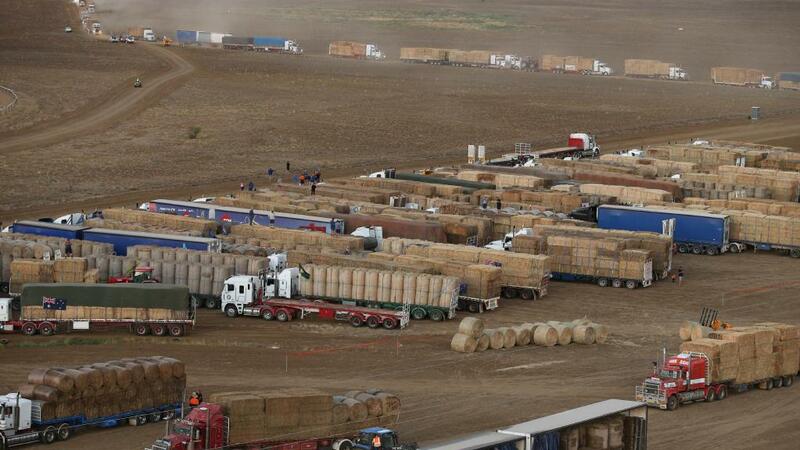 To give you an idea of what’s involved, the following are stats from a run in 2016 from Burrumbuttock (southern NSW) to Ilfracombe (central-west Qld) — 258 trucks, 406 trailers, 6 million dollars worth of hay, 1,800 km travelled, $2,500 to $3,000 in fuel and other costs per truck, more than 13,500 rounds and square bales of hay, 800 farmers feeding 300,000 animals, trucks from NSW, QLD, VIC, SA and TAS, and more than 500 volunteers. Members of the Down Under Club of Winnipeg with the Burrumbuttock Hay Runners banner. Photo: Charlie Powell. 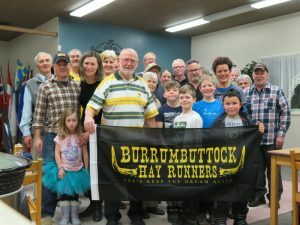 The motto of the Burrumbuttock Hay Runners is ‘keeping the dream alive’. They believe in doing whatever it takes to help keep the dream alive for Aussie farmers. And for that, we say THANK YOU! For more info or to make a donation, visit http://hayrunners.com/.